To be fair, I only received this book in today's post but at 133 pages (and many of those being sample forms) it's not exactly a taxing read. My first impressions were that of slight disappointment. 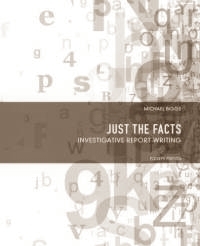 While subtitled Investigative Report Writing, the book is clearly a basic primer aimed distinctly towards (American) police rather than, say, your average private or corporate investigator where chapters on Crime Reports, Arrest Reports, Writing Search Warrants clearly are going to be of limited relevance. But don't be too hasty to write this book off just yet. The core of the book, in my opinion, is found in Chapters 2 to 5: Investigation Basics, Note Taking, and Rules of Narrative Writing. The chapters are concisely and clearly written (so you would expect) and laid out quite well. Key terms used throughout the chapter are introduced at the beginning and each chapter also concludes with a brief summary and review. But, and this is another gripe, the individual chapters are quite short. Most chapters number only 5-9 pages and that includes full-page sample forms or end-of-chapter 'quizzes'. As I said earlier, this book appears to be a primer rather than a concise guide. Complex topics are given only a cursory examination (compare the 1.5 pages on conducting an interview with the 522 pages in 'Investigative Interviewing' - although not a fair comparison, I'll grant). It even has the dimensions of a highschool exercise book. However, for all that, there are a number of useful tips and advice contained within this slim volume. Whether it is worth the asking price is another question. It's concise. Chapters are brief and to the point. Layout. I like the way that terms are introduced at the beginning and the summary and review at the end of each chapter. It's maybe too concise. While brevity and relevance are a good thing, I felt that topics covered are given only a cursory explanation lacking any real depth. Okay for a primer but just not very satisfying. Misleading title. I'm possibly a victim of my own expectations on this. Non-Relevance. A lot of the book, while still somewhat interesting, just isn't all that relevant to the private sector. Also, I wonder how useful the 'Writing Search Warrants' chapter is to police in any location other than California? I think that a lot of my feelings of disappointment are due to the fact that I was expecting something other than what I received. Taken on its on merits, this book is probably better than I give it credit for. However, for my purposes, I rate it a C or C+. It's nice enough to have but I wouldn't be rushing out to buy a copy. And you'd be better off buying second-hand rather than new. Thanks for the review. One thing though, you mention that you would be better off buying it second hand. But with the book having perforated pages I would be a bit cautious in case some pages were missing. Good point there. Yes, that could be the case (again, why those perforated pages?). On Amazon it does give you a guide to the condition of second hand books ('as new', 'good') etc so you'll probably have some indication at least that it would (or at least should) be intact.